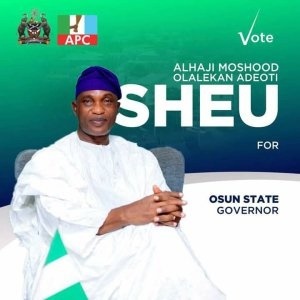 Few hours to Saturday's governorship election, the All Progressives Congress (APC) is alleged to have offered the Action Democratic Party (ADP) candidate, Moshood Adeoti, a senatorial seat if he steps down from the contest. Adeoti, from Osun West, was also allegedly offered N200milion to cover the cost of stepping aside; multiple sources within the party confirmed this to Bounce News on Friday. President Muhammadu Buhari was said to have invited Adeoti for a meeting during his visit to the state on Tuesday but the politician did not honour the invitation. Adeoti, who has also rejected offers from the Peoples Democratic Party and Iyiola Omisore' s Social Democratic Party (SDP), is popular because the thinking among some Osun residents is that it is the turn of Osun West. Adeoti is from Iwo. One of the three largest towns in Osun. He was also the immediate Secretary to the State Government. He served for seven and half years before he resigned in July after losing the APC primary. Aside being from the West, he has the backing of some APC leaders who are not comfortable with Ahmed Tinubu's dominance of the party.